I try to keep this blog fun and lighthearted because the world can sometimes be a harsh and heavy place. I like to think of Crafty Confessions as a place to escape from this and just get lost in creativity. Today, however, I need to address something dark. Something that effects every single one of us: Bullying. Bullies: STOP. Not just for the sake of those you are hurting, but for yourself. Every cut you make to someone else is a cut to your own soul. You may not see it now, but one day those wounds will appear. Have you ever cut yourself, but didn't notice until you saw the blood? Suddenly it hurts. This will inevitably happen to those who bully others. Do you understand what I'm saying? 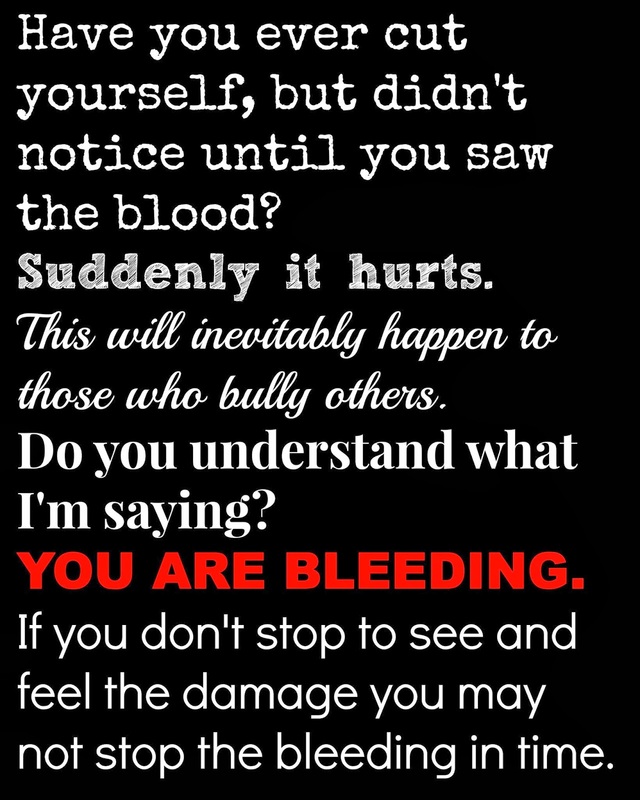 YOU ARE BLEEDING. If you don't stop to see and feel the damage you may not stop the bleeding in time. Parents: Do you see your child? Your bully? They are injured. Don't ignore it. As a parent it is your duty to point it out. You might not want them to feel the pain, but if you don't do something the blood of your child and the child they are hurting is on your hands. I also have a message to those who are being bullied: It WILL get better. I don't know when. I wish I could tell you, but just know that it will. I know if feels like you can't just sit around and wait for that someday to arrive. The pain might seem like too much, but hold on. Hold to your family. Hold to your faith. Hold to the knowledge that there are people out there that have made it through the same storm. Stay strong and know you are loved. Think about those plus size celebrities, how do you think they maintain their iconic style statements? Obviously, it is because they are not afraid to show the replica chanel 2.55 bags what they have. They are not bashful to expose their extra curvaceous figures and above all, they have the confidence to show people their self – expression using the trendiest plus size omega replica. Moreover, oversized outfits in the recent trend come with different variations of fantastic designs, images, cuts as well as forms. From container tops to sweaters, from mini – skirts to flared gucci replica, from formal to corporate attires, they have it all in plus size thus, regardless of your walk in life, there’s a perfect chic plus size panerai replica sale that matches your daily activities. La Samaritaine is the fourth of the historic grand department shops of Paris, france. Like the others, it gives the finest in replica watches along with beautiful historic buildings. Everything from books to fitness wear is available as of this wonderful store. As being the values with Replica Handbags uk the products nearly all energy considered since excessive plus unaffordable, some parents from your teens currently have looked and as well found a superb path to own their teen daughters any high-demand bags continues to be wholesale bags. Since they varieties of teens would genuinely wish to sustain all of the present styles as well as grab one of these brilliant expensive hand bags, parents nonetheless found replacement for satisfy their teens. Since parents will really want their own teenage daughters being happy, what we can do when entering handbags retailers, they will select the from suppliers handbags.The values of such forms of wholesale artist handbags ensure that is stays feasible for younger girls' parents to tend their little girls.Most individuals teens today want well-known developers handbag to seize.For your particular teenage parents who would like their girls to be aware of the blessing about quality and likewise style, the method of wholesale handbags caused so it is achievable to enable them to provide their unique daughters any lifelong understanding of economize but Louis Vuitton Replica Handbags filled with fashion goods and creating their kids smiling.To come to light of many these, most amazing brands within the international trend world have hold most of these fashionable types and stayed to offer their styles to secure a rising consumer.